Shim-pack XR Series columns use a 2.2 μm packing particle size and offer a skillful balance between resolution efficiency and pressure. An XR Series column resolution equivalent to a general-purpose column with 5 μm packing particle size (Shimpack VP-ODS), but significantly reduces the analysis time. The pressure on the column under many analysis conditions does not exceed 35 MPa. Consequently, ultrafast analysis can be comfortably performed on an existing instrument. The two chromatograms to the right show conventional analysis that is performed faster. The lower chromatogram is the result of analysis using a Shimadzu Shim-pack VP-ODS general-purpose column. The upper chromatogram is from analysis with a Shim-pack XR-ODS fast analysis column. As both Shim-pack VP-ODS and Shim-pack XR-ODS offer identical resolution properties, Shim-pack XRODS maintains the resolution while significantly reducing analysis times. Customers can select the ideal column for the intended analysis. In addition to the versatile Shim-pack XR-ODS that is bonded with the C18 group, the comprehensive Shim-pack XR Series product range includes the Shim-pack XR-C8 that is bonded with the C8 group to give different retention behavior to ODS, Shim-pack XR-Phenyl that is bonded with the phenylpropyl group, and the normal-phase Shim-pack XR-SIL silica column that achieves higher speeds. The fat-soluble vitamins Vitamin E (tocopherol) and Vitamin A (retinol) were analyzed. The Shim-pack XR-C8 column achieves higher speed than a conventional C8 column. The column was switched from Shim-pack XR-ODS to Shim-pack XR-Phenyl to improve the resolution. The difference in retention properties between the ODS group and the phenylpropyl group improves the peak shape, controls the resolution, and further reduces the analysis time. Organic solvents are used as the mobile phase for normal-phase analysis. Due to environmental considerations, it is necessary to reduce the consumption of mobile phase compared with normal reverse-phase analysis. The Shim-pack XR-SIL silica column increases the speed of normal-phase analysis while reducing the consumption of mobile phase. In this example, the analysis time is reduced by 80 % while maintaining the flow rate, thereby reducing the overall mobile phase consumption to 20 % or less. 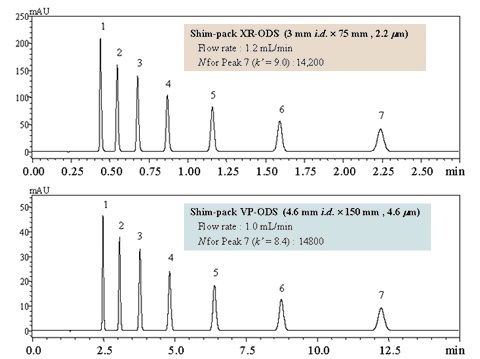 While the Shim-pack XR-ODSII/III use the same 2.2 μm packing particle size as the Shim-pack XR Series columns, they have higher 60/100 MPa pressure tolerance to achieve high-resolution fast analysis in a long column using a water/methanol mobile phase. This column significantly extends the range of applications of high-resolution fast analysis to include analysis near room temperature. The Shim-pack XR-ODSII/III columns are ideal for the Nexera UHPLC or Prominence UFLC. This combination achieves both faster speed and higher resolution. The Shim-pack XR-ODSII range includes a 1.5 mmI.D. model in addition to normal 2 mm and 3 mmI.D. columns. With an optimal flow rate of 0.2 to 0.3 mL/min, the 1.5 mmI.D. column offers the optimal flow rate for LC/MS and reduces mobile phase consumption. The pressure resistance of Shim-pack XR-ODSIII has been increased to 100 MPa, so when a 200 mm-long column is used, both faster speed and higher resolution can be achieved. The Shim-pack XR-ODSIII with an increased pressure tolerance of 100 MPa can be used for a wider range of applications while maintaining the ease of use of the Shim-pack XR-ODSII. By combining Shim-pack XR-ODSII /III with Prominence UFLC or Nexera, high-resolution and high-sensitivity detection of minute components can be achieved in impurity analysis, etc.